As long as it was at least a little bit out there, Mugs Stump was always psyched for something, be it a big wall, long free route, frozen waterfall, or high alpine face. A true “climber’s climber,” he wanted to stay on the edge, pushing the envelope of possibility, getting to that rare place where you climb intuitively, fluidly, unburdened by doubt and fear. On May 21, 1992, Mugs died while guiding two clients down Denali's South Buttress in a storm, the victim of a simple misjudgment and a substantial dose of bad luck. Investigating the route ahead, he strayed too close to the unstable edge of a huge crevasse. When it collapsed, Mugs fell and was buried beneath the jumbled mass of ice. At a memorial service in Salt Lake City later that summer, several of his friends came up with an idea: why not establish an annual grant in Mugs’ name, so new generations of climbers could draw inspiration and sustenance from his memory? The Mugs Stump Award began as a back-of-the-envelope affair, and remains so today. Started in 1993 by Black Diamond Equipment, Climbing Magazine, Patagonia, and W.L. Gore & Associates, the Mugs Stump Award has grown to include Mountain Gear (in 2001) and PrimaLoft (in 2007) as sponsors. In 2008, and again this year, we gave out $30,000 in grants to committed climbers to help them fulfill their dreams of fast, lightweight, leave-no-trace ascents in the world’s remote high places. 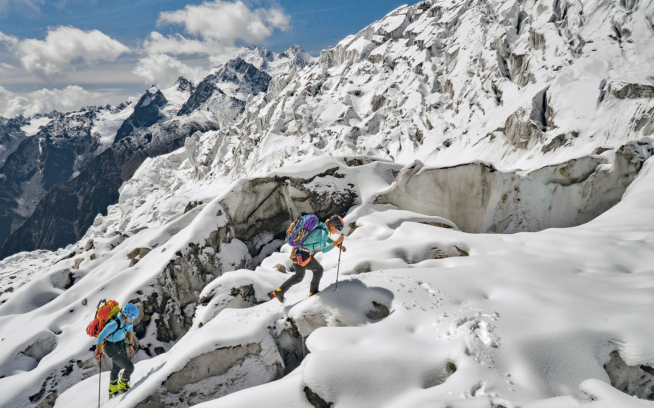 The applications received for 2009 included many strong teams with objectives in far-flung corners of the mountaineering world, from Patagonia, to Pakistan, to the Canadian Rockies, to Alaska. In the end, seven teams with outstanding talent and objectives were granted awards ranging from $1,500 to $9,500. High on the Cassin Ridge three climbers considered their options. It was bitter cold and snowing hard, and as far as they could tell they were off route. Searching for a decent bivouac among the windswept granite cliffs, they were astounded to see a lone figure off to the side, climbing quickly and confidently up into the raging storm. Carrying nothing but the ice tools in his hands, a liter of water, a few energy bars, a stove, and a parka stuffed in a day pack, Mugs Stump paused briefly to shout directions to the trio. Concerned that he'd disappear into the clouds above and never be seen again, they told him he'd be welcome to share their shelter. It was early in the morning on June 5, 1991. Mugs briefly considered staying with the three climbers. "I knew how bad it could get up high," he said several months later. "I had to make a conscious decision to keep going." But feeling that the storm wouldn't get any worse, he pressed on toward the summit of North America's highest peak. Mugs had developed a keen sense of the vagaries of the region's weather from his years of experience in the Alaska Range, so the intensity of the storm came as no surprise. He had also made several previous ascents of Denali, including two of the Cassin, and realized that he now might be climbing into a trap. Though he had already dispensed with the major technical difficulties of the route, the wind and cold could stop him dead in his tracks at almost any point. Nearly 4000 feet lay between him and the cloud-encased summit at 20,320 feet. And from there he'd still have to make a tiring, 6000-foot descent before reaching the safety of his camp. Mugs had started at 14,200 feet on the West Buttress at 9 p.m. the previous night, traversing over and descending the steep West Rib to the start of the Cassin Ridge at 11,500 feet. Near the bottom of the West Rib he encountered a party laboring up the steep snow, belaying each other and carrying heavy loads. "You're bumming our epic, man," one of them commented as Mugs sped past. Continuing on in the twilight of the Alaskan summer night, he motored up the Japanese Couloir and the ice ridge above, then tackled the difficult traverse necessary to circumvent the bergschrund below the Cassin's hanging glacier at 13,900 feet. At 5 a.m. he came across a Czech climber bivouacked in the first rock band. The weather had started to go bad, and Miroslav Smid made tea while the two got acquainted. "We are solo brothers," Smid told Mugs, offering him a spot in his tattered tent until the weather improved. After a short stop, though, Mugs continued up the route. By the time he'd reached the off-route party in the second rock band, Mugs was climbing in a full-scale Alaskan blizzard. Yet there was something oddly serene about the snow drifting silently down the steep granite and the surrealistic gray clouds swirling all around. "I felt very comfortable being up there alone, at home," he said later. Even the distant howl of the wind on the summit ridge seemed less threatening than usual. His intuition about the storm and faith in his capabilities paid off. A few hours later, Mugs climbed through the clouds into the morning sun, and soon he was standing happily atop the Cassin Ridge at 20,000 feet. He had spent 15 hours on a route that even fast roped parties climb in four or five days. Eschewing the summit, a half-hour of easy walking away, he headed down, taking a short nap in the middle of the "Football Field," the 19,000-foot summit plateau, along the way. Mugs stumbled back into his camp on the West Buttress at 12:30 a.m. on June 6, just 27 1/2 hours after leaving it. As long as it was at least a little bit out there, Mugs Stump was always psyched for anything – big walls, long free routes, frozen waterfalls, or high alpine faces. A true “climber’s climber,” he wanted to be on the edge, pushing the envelope of possibility, getting to that rare place where you climb intuitively, fluidly, unburdened by doubt and fear. Although Mugs readily shared his experiences with friends in conversation and letters, he seldom wrote articles or lectured about his climbs. The act of climbing, the doing, was the important thing. The Emperor Face on Mount Robson in the Canadian Rockies, the East Face of the Moose's Tooth and the Moonflower Buttress on Mount Hunter in Alaska, his two big solo routes on Mount Gardiner and Mount Tyree in Antarctica, and his one-day solo of the Cassin were all precedent-setting climbs, but he wasn't primarily concerned with either his physical performance or making history. For Mugs was more than just a superb athlete – he pursued his climbing, and his life, as a quest for spiritual enlightenment, a search for the godhead. Other climbers were stunned by his rapid solo of the Cassin – the closest anyone has come to his time was Charlie Porter, who took 36 hours from the top of the Japanese Couloir during the first solo of the route in 1976 – but Mugs considered this audacious ascent as just another step along the path he'd been following for well over a decade. Inspired by the enchainments done in the Alps, he'd even thought about doing a super link-up of hard routes on Denali, Mount Foraker, and Mount Hunter, the three highest summits in the Alaska Range. It would be a project of almost unimaginable proportions, involving miles of glacier travel and close to 30,000 feet of elevation gain as well as difficult climbing in harsh Arctic conditions. Before the Cassin solo, he had planned to solo a new route leading up from the head of the remote Peters Glacier to Denali's north summit, and after a rest, go on to the Cassin. "The Fathers and Sons Face [as he had named his proposed route] has become a deep part of me," he wrote in his journal at the time. "It can be done on-sight and solo, and it is extreme and big and at altitude in Alaska! It is the epitome of this type of big mountain climbing." But during a lengthy reconnaissance and acclimatization period on the nearby West Buttress, he became increasingly concerned with the amount of new snow building up on the route. He decided to leave it for another year, opting for the Cassin alone. "The Cassin wasn't the ultimate," Mugs told me later, as we sat around his ramshackle house in Sandy, Utah, last February. "What it really did was to open my mind to lots of other possibilities." We talked about some of those possibilities, about climbs past, and what he or I or our contemporaries might be capable of, about what the next generation of alpinists would do and the potential adventures that would be left for our children. As always, Mugs was full of plans: for 1992 alone, he had lined up forays to the Black Canyon, Yosemite, Alaska, Baffin Island, and Antarctica. He was in the middle of negotiating the purchase of the house he'd lived in for several years, and he had hopes of getting a concessionaire's permit to guide on Denali. He was as happy and as at peace with himself as I'd ever known him to be. It was an enlightening discussion, pleasantly interrupted by friends passing through on their way to a ski tour, random questions from other house guests, and numerous trips to Mugs' library to dig out references to certain peaks or faces. Crumpled sleeping bags littered much of the open floor space, and ropes, racks, and ice gear haphazardly decorated the walls. We parted with tentative plans for a climb together in 1993, our first in several years. "Much form and concentration," he wrote to his parents in March after making the first winter ascent of the Hallucinogen Wall in the Black Canyon of the Gunnison, Colorado, with John Middendorf. "Home on the stone. Close to those I love and the 'big force.'" The day before Mugs left for Alaska later that spring, he told me about the Hallucinogen and we talked about our proposed trip, going over the mundane details of peak fees and the logistics of Third-World travel. "Do you think you'll really be able to spend that much time away from home?" he asked me, more concerned about how I'd feel leaving my young son for such an extended period of time. Three weeks later, on a perfect Saturday morning as I packed lunch before leaving for a mountain-bike ride, the phone rang. It was Billy Westbay, an old Colorado climber I hadn't seen in years, who had been to India with Mugs in 1988. He had terrible news. On May 21, Mugs was killed while guiding two clients down Denali's South Buttress in a storm, the victim of a simple misjudgment and a substantial dose of bad luck. Investigating the route ahead, he'd strayed too close to the unstable edge of a huge crevasse. When it collapsed, Mugs fell in and was buried beneath the jumbled mass of ice. Mugs started climbing at a relatively late age – he was 26 when he did his first roped climbs in Utah – but his sense of the spiritual potential of athletics started early on. "I can look back and I remember … when I first realized that my life was not going to be as [his father's], an incredible feeling of freedom, realizing a choice that was a part of me," Mugs wrote in his journal on the Kahiltna Glacier in Alaska in the mid-1980s. "I was lying on the grass end of Dietrich Field watching the clouds pass over the mountains and Mifflintown [his hometown in Pennsylvania]. I had just run about 15 miles. Something in me so natural created by the push of my physical body. An opening of my mind brought to be part of the beauty of the earth around me. I thought of the abilities I had and how high they could take me, and how close to God, the spirit that is in everything, I felt when using them. I thought then I would probably be a professional athlete. I was 15." Born and raised in Mifflintown, Pennsylvania, where his parents still live, Terry Manbeck Stump started fishing, hunting, and camping at an early age with his father, Warren, and his brothers, Ed, Quig, and Thad. His mother, Sis, remembers him as a happy and energetic child who nevertheless seemed to live by the adage "question authority." Although sometimes unruly, Mugs was well liked by his teachers and often displayed a surprising sensitivity for one so outwardly tough. During his first couple of months at grade school, his mother recalls, Terry, as he was then known, would cry and cling to her leg when she dropped him off. He later told her that he remembered being afraid of his first-grade teacher. His father, who worked hard at the family's grain-and-feed business, was usually gone early in the morning, but eventually he became the one to take Terry to school, and the crying stopped. Later, in high school, when his classmates made life hell for their ninth-grade homeroom teacher, Terry told his mother he felt for sorry him. "The way some of those kids treat Duffy [as the teacher was nicknamed]," he told her, "I'd like to hit them." Mugs played baseball, basketball, and football throughout his school years. He made the honor roll in his senior year of high school, and also was an all–state quarterback and captain of the "Big 33," a team of the best high school players in Pennsylvania – a state in which people eat, breathe, and sleep football. "I remember when you (Dad) came up to the field in the evening and would stand by the stands and watch me do my drills," Mugs wrote in his Kahiltna journal. "I would push hard for you, a communication we made to each other without saying a word. It made me so proud and happy. Wanting you to know that I loved what you gave me." He attended Pennsylvania State University on a football scholarship, and his teammates came up with "Mugs," the moniker he’s been known by ever since. By the time he'd graduated in 1971 with a degree in Recreation and Health, Mugs had started in two Orange Bowls. "He wasn't the best athlete on the team," says Joe Paterno, the well-known Penn State coach, "but Terry was very enthusiastic and courageous, a strong leader, and a hard worker." He was also an independent thinker. Paterno recalls that Mugs was the only player he ever had to tell to get a haircut. When he informed Mugs that he had a choice of playing second-string quarterback or third-string defensive back for senior year, an undaunted Mugs told him he'd play defensive back and start in every game, which he ended up doing. After college he skied in Aspen, Colorado, for a winter, and then played a year of semi–professional football. Mugs realized that he was probably too small to make it into the big leagues, and he moved to Snowbird, Utah, in the winter of 1972–1973 to ski full time. Mugs soon became well known for his go-for-it-attitude both on the hill and off – wild apres-ski parties being the major form of entertainment in the isolated Snowbird community – and after two years of skiing virtually anything that held snow, found himself increasingly drawn to the backcountry. He spent his summers roaming the Wasatch wilderness surrounding Snowbird and by the winter of 1974–1975 had given up lift skiing in favor of touring. Bill MacIlmoyl, Mugs' roomate at the time and a constant companion both on and off the slopes, recalls, "Mugs' favorite thing was to go up early and lay down a bunch of tracks before the helicopter skiers came out." As Mugs ventured into steeper and wilder terrain, he sought out local climbers and avalanche experts for advice, and in the summer of 1975 made his first roped climbs. "Rock climbing is the ultimate spiritual communication with our center – God!" he wrote to his parents that fall. Climbing soon supplanted skiing as his raison d'être. As he and MacIlmoyl watched the sun come up after a night on the summit of Mount Timpanagos early in the summer of 1976, Mugs said, "This is what I want to do – climb all over, do big routes, really big routes." A quick study, Mugs soon started to do routes that were hard by anyone's standards. In the summer of 1977 he spent two months in Chamonix, France, climbing classic snow and ice routes. The trip culminated in an epic attempt on the Dru Couloir (then regarded as one of the most difficult ice climbs in the Alps) with Randy Trover, Steve Shea, and Jack Roberts. Starting out with no bivy gear, and food and water for a single day, they got off route and were trapped on the face by a storm for two days. They barely made it off the mountain alive when, in the worsening storm, the ropes repeatedly froze to the anchors; unable to pull them through any more, the four finally abandoned them on the last rappel. "If we'd started down 10 minutes later," said Trover at a memorial service held for Mugs in Utah last summer, "they would have been doing this for both of us 15 years ago." The climbs only got harder. In spring, 1978, Mugs attempted the second ascent of the Hummingbird Ridge on Mount Logan, Canada’s highest peak, with Trover, Jim Logan, and Barry Sparks. After 10 days of hard climbing and marginal bivouacs on a new direct start, the four reached the point where the original ascent party had gained the upper ridge, but retreated with several thousand feet and many corniced miles still to go. For Mugs, it was nevertheless a pivotal climb. "He came away from the Hummingbird knowing he could do anything he wanted," says Trover. Later that summer, Mugs and Logan returned to Canada intent on the Emperor Face on Mount Robson. Logan, a very experienced climber from Colorado, had tried the unclimbed face three times previously, and now the pair was determined, as Logan later wrote in the 1979 American Alpine Journal, "to spend all summer if need be in the attempt." They spent two weeks observing their route and waiting out storms from a camp near Berg Lake, then clearing weather prompted them to move up to a bivouac at the base of the 4000-foot upper wall. On the second day, 60-degree ice slopes interspersed with thinly iced rock steps – the most difficult ice climbing Logan had ever done – took the pair to a good bivouac on a snow rib in the center of the face. The difficult mixed climbing continued to an uncomfortable third bivouac on tiny seats chipped out of a 70-degree ice slope. A storm moved in that night, and spindrift avalanches threatened to push the two off their airy perch. The final headwall loomed above. Mugs led up steepening ice to its base, then Logan took over the crux lead, a full ropelength of intricate aid and mixed climbing on loose rock. It took him eight hours. A few more easy ice pitches and they reached the summit ridge, where they spent the night. 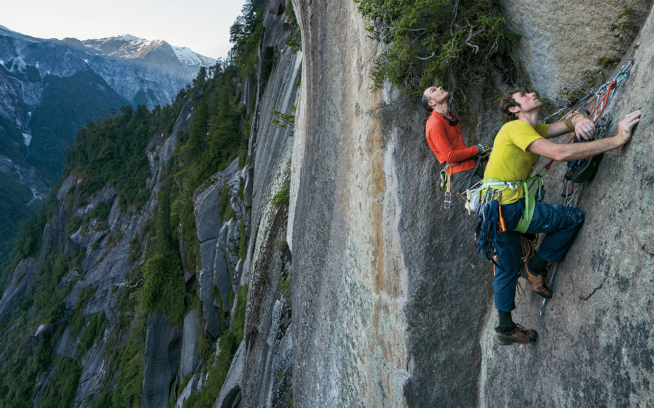 Mugs and Logan had made the first ascent of one of North America's greatest alpine prizes, a route that had repulsed numerous attempts by some of the strongest climbers of the day. The achievement gave Mugs a heightened sense of inner strength and a feeling of the "rightness" of the path he'd chosen. "I have felt myself going through some amazing changes on the walls in the last year, becoming totally relaxed and comfortable, feeling like this is the place I belong," he wrote to his parents several months later. "It can be so peaceful … even in the most extreme situations. Feelings of endless space and time made so real, a closeness to nature. A sense of accomplishment and a sense of worthlessness – a combination that feels so fine." Mugs had a recurring dream that he related often to his friends. In it he had just climbed a very challenging new route, sometimes alone, at other times with a partner, but the style was always impeccable: using neither pitons nor aid, he had done it quickly, leaving no trace of his passage. Next in the dream, he went to a pub and was sitting in the corner with his girlfriend when a group of climbers who had just done the same route came in. The climbers were toasting themselves about their seeming first ascent, and after joining their celebration Mugs would sit back and smile. All that was important, he would say, was his own knowledge that he had done the climb the way he'd wanted to. The dream represented an ideal that Mugs would pursue consciously and persistently throughout his life. "Doing the extreme is not the point," he wrote to his parents after climbing Fitzroy in 1980. "I care less and less about that, but the desire to climb and be with nature's and the mountain's forces is still there, strong as ever. I don't care about accomplishments. I care about fulfilling dreams of being happy." To Mugs, being happy would mean achieving an ego-less state of perfection, "Living outside and exercising, moving every day, climbing – just looking." Even at his house in Sandy, he'd sometimes sleep in his van with the doors open. Although Mugs traveled widely and loved rock climbing perhaps best of all, the snowy expanses of the polar regions are where he came closest to reaching his ideals. He made four trips to Antarctica under contract with the National Science Foundation. He took his work as a safety consultant as seriously as his guiding. "Mugs was not just a one-man climbing machine, he was into doing the best job possible to ensure the science was done," says Paul Fitzgerald, a geologist who worked with Mugs both in Antarctica and Alaska. "Of all the field assistants I've had, Mugs was easily the best, not just because he was the best climber, but because he really got to understand why we wanted to do things the way we did." Mugs developed a special affinity for the pristine and barren continent of Antarctica, and did much off-the-record exploratory mountaineering there, including two of his purest climbs ever, the 7000-foot Southwest Face of Mount Gardner and the 8000-foot West Face of Mount Tyree – each solo, without bivy gear, and in a single day. He never said much about any of his climbs in Antarctica (outside of sharing information for a brief report I wrote for Climbing in 1990 highlighting the Gardner and Tyree ascents), preferring, I think, to share the memories and feelings engendered by these remote gems with only a few close friends. Well before his first trip to Antarctica in 1980, Mugs had ventured north, and over time, Alaska would become his spiritual home. "It's so, so beautiful, unique," he wrote his parents in 1984. "Subarctic lands have such a vast, quiet beauty, a stillness I really hope I get the chance to share with you." The pioneer atmosphere and booming economy of the 49th state also appealed to his free-spirited nature. In the late 1970s and early 1980s Mugs earned his living between climbs by salmon fishing off the Alaskan coast. Later, he guided extensively on Denali and elsewhere in the Alaska Range. He returned again and again to peaks surrounding the Ruth Gorge, attempting Mount Johnson several times and climbing a host of routes on lesser-known peaks in the area. His greatest climbs in the Alaska Range, however, were on three of the region’s most celebrated mountains, the Moose's Tooth, Mount Hunter, and Denali, the first two just a few months apart in 1981. In March of that year, Mugs and the legendary Yosemite hardman Jim Bridwell made the first ascent of the East Face of the Moose’s Tooth, a 4500-foot wall that had repulsed some 10 strong attempts in the previous decade, including one by Mugs and Jim Logan in 1979. Mugs and Bridwell's was an exceptionally bold effort over five days in frigid conditions and with minimal food and equipment. After several days of storm, the two started out a bit hungover after "deliberating on whether to wait another day while consuming large quantities of whiskey," as Bridwell wrote in his 1981 article about the route. In contrast to the earlier attempts, which had all concentrated on the central aid line, Stump and Bridwell climbed icy gullies to the right, then traversed back left on sparsely protected ramps to the center of the wall. They tackled the crux section of the climb, seven pitches of steep, ice-choked chimneys, on the second day, then continued up an A4 headwall and more tenuous mixed climbing on the third. Gorp, coffee with sugar, and two packets of soup were their entire rations for the climb, so when the pair reached the top on their fourth day they were hungry and severely dehydrated. After a bivouac near the summit, the pair dropped onto a 1500-foot rock face, aiming for a wide snow couloir that would eventually deposit them at their basecamp at the bottom of the wall. As they descended, the rock got worse and worse. They hadn't brought any bolts, and wished they had. Ten pitches down, they had no choice but to rappel from a single #3 Stopper. As Bridwell started off, Mugs looked at the anchor and reached towards it, ready to unclip, then dropped his hand. He'd prefer a quick end to a futile wait of a day or two. One more rappel got them to the snow, and two hours later they were celebrating in their tent on the Buckskin Glacier. Although Mugs would later say that his and Bridwell's climb was, in retrospect, unjustifiably risky and probably not worth repeating, he had no such doubts about his other great Alaskan climb that year. The Moonflower Buttress on Mount Hunter, which he climbed with Paul Aubrey, represented a quantum leap in technical difficulty for climbs in the Alaska Range. Asked 10 years later what had been his best route, Mugs said, "Probably the Moonflower Buttress – doing it just like I'd hoped. It was a very aesthetic line, safe and difficult. It had all the elements." It was also the only climb on which Mugs ever published an article. The story, which appeared in Mountain 85 and the 1982 American Alpine Journal, describes a four-day odyssey, punctuated by precarious bivouacs and the odd pitch of aid, up icy ramps and grooves. "I thought of what I'd done to get here, not just in the last four days but in the years past," Mugs wrote of the final night. "I felt part of some great movement, one of an infinite scale, too grand to see but only to feel in the night's wind. In the vastness in front of me, I felt even more isolated. I was a shell, the same as the figure beside me and the mountains around. I felt an aloneness, my thoughts totally my own, creating a peacefulness of beauty and friendships." Summing up an incredible year, Mugs wrote later in 1981, "My imagination is a gift for my life. The climbs to do are creations – to understand what is there, not to be surprised. The more I have done and been with other climbing partners, the more I have learned about myself. I am so lucky to have such a life, to have such freedom – not the political or social, but the freedom that is my spirit." Climbers are prone to a certain hubris, and Mugs was no exception. At his best he was generous, supportive, and enthusiastic, but he could also be selfish, insensitive, and moody. More than anything, he wanted to be a good person – humble, open, caring, and, above all, centered – and he struggled mightily with his own ego and insecurities in finding that perfection. His relationships with his many girlfriends, in particular, were intense and joyful, but often strained. "We struggled in the relationship because he could not be owned," says Lynne Romano of her time with Mugs in the past two years. "I finally asked him for more than he could give me, and we were no more." It seemed as though he could relate more openly to women he wasn't intimately involved with. Indeed, he counted many women, several of them ex-girlfriends, as his closest friends. "He was the most important person in my life," says Mona Wilcox, who lived with Mugs on and off in the 1970s. "He taught me everything – about the mountains, climbing, skiing, living." She is happily married to one of Mugs' old climbing partners from Telluride, but she and Mugs regularly kept in touch with each other over the years. "Words just don't fulfill the experience of things like I am trying to say and do," Mugs wrote to Mona in 1985. "I'm glad that you know me and know what I hope to be and feel in my life." "Mugs had a huge ego – he was the most selfish person I've ever known," says Jenny Edwards, an occupational therapist whose Anchorage house and Talkeetna cabin had been his base of operations in Alaska since the mid-1980s. The two were incredibly close nevertheless. "I knew Mugs neither as a guide or a climbing partner," says Jenny, "but as a spirit sister and soul mate, and loved him with his imperfections as he did me." Diane Okonek, a long-time friend from Talkeetna, also remembers his sensitive side. "Mugs would always come by and we would spend a few hours catching up on each others' lives," she says of his return to Alaska each spring. "Sometimes we would laugh and sometimes we would cry, and it was always a special time for us both. I have always thought of Mugs as one of those rare men who was self confident enough to allow his gentle side to show." Mugs could be intimidating to those who didn't know him well, but it usually didn't take long to break through that shell. "I have climbed on and off for 30 years and have never met a guide as considerate, capable, and likable as Mugs," says Bob Hoffman, one of the clients with Mugs at the time of his death. "He had a gift for bringing out the best in people, for showing them how to overcome fear and do things they felt unable to do." Mugs was a good mentor and coach, although he could be demanding. "Some days he would be excited that I was climbing better than he. He was proud that my skills were shaped by his actions," says Conrad Anker, Mugs' protégé over the past several years. "Other days he would hold the high ground and rub it in that I was still the grasshopper." The two climbed extensively in Utah, Yosemite, and Alaska, forming a lasting friendship. In an exercise to help develop mental toughness, Mugs and Anker once drove all the way from Salt Lake City to Yosemite without talking. "By being stronger in the mind," says Anker, "Mugs felt one would be better prepared to tackle the big climbs." In 1983, Mugs and I spent eight long, difficult days on the West Face of Gasherbrum IV. On our second night out, we bivouacked sitting up in the open as a light snow fell. I stayed up late melting snow and passing hot drinks to Mugs, huddled deep in his sleeping bag next to me. But the frigid night air aggravated my already chronic cough, and in the morning I knew that I wasn't going to be climbing well. Mugs took over the lead without hesitation and got us to the base of the Black Towers at 22,500 feet, the high point of several previous attempts on the face. After we'd chopped out an airy bivouac site from the crest of an ice ridge, he led a short, difficult chimney, and fixed a rope. Good bivouacs were rare on the face and we knew that the climbing above would be time-consuming, so we anticipated staying where we were for two nights. A thin scud of gray clouds veiled the sky the following morning. As always, Mugs gave me the thumbs up as I started up the next pitch, a rotten, poorly protected overhang that left me gasping. The climbing felt like 5.12, but it would probably have been 5.8 in rock shoes at sea level. Mugs continued on, free climbing and then aiding up the steep, friable rock. He finished the pitch with a spectacular double pendulum, reaching the top of the Black Towers. We'd done what we thought would be the crux of the route, and even though we still had over 3000 feet to go, the way ahead was clear. Our two ropes barely reached the tent as we rappelled down in the worsening spindrift. We settled into "the hang," rationing our remaining supply of oatmeal, tea, soup, and dehydrated potatoes in hopes that the storm would move through quickly enough to allow us to continue. For the first few days we maintained our psyche, but as the avalanches boomed all around it soon became obvious that we weren't going anywhere but down. We spent five storm-bound nights in the cramped Bibler tent before retreating. "I thought I'd never go back to the mountains again," Mugs later told a slide show audience in New Hampshire. When we reached the relative safety of the West Gasherbrum Glacier, Mugs strode out ahead, anxious to rid himself of the intensity of the face, to go the last few miles at his own pace. I trudged on well behind him, lost in my own disappointment about the route. A couple of hours later I crested a little bump in the glacier, and there was Mugs, waiting so we could walk back into basecamp together. 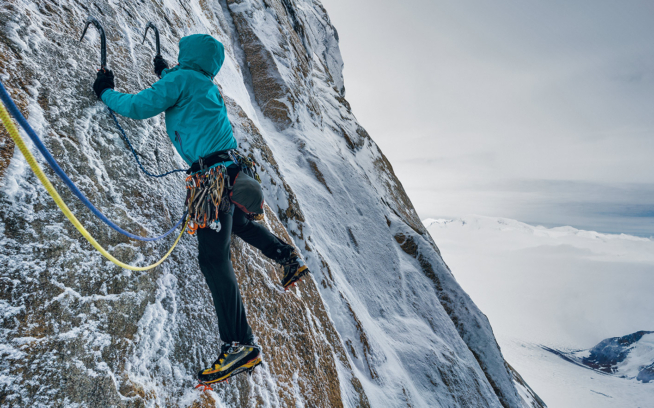 A year later, Mugs, Laura O'Brien, Randy Trover, and I traveled to northern India to try the virgin Northwest Face of Thalay Sagar, a peak that had seen just two ascents at the time. We planned on climbing independently as two ropes of two, but from the start a subtle tension was in the air. We'd had some minor hassles with the Indian bureaucracy over Laura's late addition to the team. Mugs was sullen and uncommunicative with all of us. In particular, he didn't seem to be getting along too well with Laura, who was his girlfriend and climbing partner. A few days after reaching basecamp, Trover had to retreat to Gangotri, the nearest village, for several days to recover from a bronchial infection. To top off our problems, persistent storms battered the peak, plastering our proposed route with snow and rendering it too dangerous to climb. We turned our attention to the elegant Northeast Pillar, which after several attempts had been climbed by a Polish/Norwegian team in 1983. It had also been our original objective when I'd applied for the permit for Thalay Sagar in 1982, so as a consolation prize it wasn't bad. Laura and Mugs tried it first, but high winds low on the route beat them back. When Trover and I passed them on our way up, all Mugs would say was that we didn't have a chance. "It has been a rough day, and a rough last week," he wrote to his parents at the time. "I've been very frustrated lately and going through the usual questions of the value of what I pursue at times like this." Trover and I made the climb despite the continued bad weather. It was a hard-won summit, my first after four trips to Asia. Trover had put in a stellar effort for his first climb in the Himalaya, especially considering his earlier illness and relative lack of acclimatization. We'd pushed hard all the way, especially on the descent, knowing that the porters were scheduled to arrive the morning we would return to basecamp. But when we got there early on September 15, camp was empty. No one had waited for us or left us any food or even a note. We were disappointed and angry, but not too surprised given Mugs' moodiness over the past weeks. We stashed our climbing gear in a couple of duffel bags under a boulder and trudged down the valley. Late that afternoon in Gangotri, Laura ran up to us full of smiles and hugs and questions about the climb. Mugs, who was cooking some eggs on the porch of a teahouse, barely glanced up. We moved to another basecamp nearby to try Shivling, but Trover and I were burned out, so we headed home. Mugs and Laura stayed on for a few weeks and didn't manage to accomplish anything. Our trip to India ended on a sour note, and we other three drifted apart from Mugs for a while. "I thought we'd never speak to each other again, let alone climb together," says Trover, who had learned to climb with Mugs and had been one of his best friends. Each of us eventually made our peace with him. "Mugs and I knew each other well enough that we didn't need to say anything," says Trover. "Just going climbing together was an acknowledgment that we were friends and that things would work out." The rift wasn't easily healed, but the two eventually became closer than ever. "The last three years were the best time for our relationship, despite the fact that we did almost no climbing together," says Trover, who with his wife, Adrienne, now has a three-year-old son, Eric. "We became his surrogate family. The way Mugs latched onto Eric was incredible – I think he realized it was as close as he'd ever get to having children." When I had left India, I'd thought that Mugs had simply gotten too full of himself. He seemed to feel that his obvious talent and drive somehow made him a better person than the rest of us, and that the world owed him something. He had even expressed some bitterness over the fact that we'd paid for the entire trip out of our own pockets, forgetting that it had been largely a matter of our own choice not to seek sponsorship. In retrospect, it seems to me that Mugs underwent something of a spiritual crisis at that time, that he lost sight of his chosen path. Success in the mountains didn't come as easily as it had for several years. He made two more frustrating trips to India to try Meru, for example, as well as three attempts on the East Buttress of Mount Johnson in Alaska. They were the only two routes he returned to that many times. Others I've spoken with have commented that Mugs seemed out of sorts for a lengthy period of time in the mid- to late-1980s. A letter he wrote to Mona Wilcox in 1985 while he was recovering from knee surgery confirms this impression: "It's been good to have this quiet, still, sedative time here to catch up on some thinking ways, reading and going into my spirit some, to try and reach some understanding about myself [that has] slipped away the last couple of years. I haven't felt as centered as I used to." In the end, Randy, Laura, and I gained a deeper understanding of both ourselves and of Mugs, and developed a stronger and more complete friendship with him, as have many who were close to him as he grappled with the vicissitudes of his life. We all struggle to balance our inner yearnings with the demands of the world; our lives are littered to one degree or another with unkept promises to ourselves and others, but we hope that our existence has a purpose beyond the self. It was this search for a deeper meaning that always preoccupied Mugs. In December, 1991, Mugs went back East for the first time in several years to visit his family and friends, and at Christmas his father told him he was facing some serious potential health problems. "What a month this has been with the closeness to death," Mugs later wrote. "Many thoughts about the fullness and happiness that is held with our friends. I do in my personal (and selfish?) self find a lot of peace and happiness in this drifting way with climbing and the mountains. But it is so good to see those close to us and give our time to those we love." Earlier in December, Mugs stayed by the bedside of Gavin Borden as he succumbed to the final stages of cancer in a New York hospital. A wealthy heir and publisher of college textbooks, Borden had been Mugs' best client, but more than that he became a true friend. His death affected Mugs deeply. "The feeling of love and caring for others seems to be a natural part of us, yet so many times we don't let it out," Mugs wrote. "I guess one way I keep a positive outlook is by trying to keep aware that we are all of the same place. When I look into Gavin's eyes or my dad's eyes and I see the fear and worry, I just wish I could somehow help them have peace. "Our lives are so wonderful and it's all we really know," Mugs concluded. "We want to keep its joys, but there must be such an amazing awakening in death. I can't imagine that the supreme God is not realized, or at least in a way there is a true awakening that we are all a part of it." Bio: Michael Kennedy is the editor and publisher of Climbing, and has been climbing for nearly 40 years.